A martingale is a dog collar that slips over the dog’s head, rather than being buckled or snapped on, and that tightens to a set point when the dog or handler puts tension on the leash. Martingale collars were originally called “Greyhound collars.” Why? Because this style of collar was originally designed for sighthounds, such as Greyhounds, because their necks are wider than their heads. Such dogs needed a specialty collar that would stay on their thick necks without slipping off of their thin faces. 20-30 years ago, martingale collars experienced a surge in popularity among regular dog owners, for an entirely different purpose. At the time, choke chains were the most common tool for training leash walking skills. If you dog pulled, you snapped the leash and collar to deliver a swift and temporary jolt to your dog’s neck. Your dog was supposed to learn, over time, that when they pulled, they got shocked, and when they did not pull, they did not get shocked. The martingale began being used by dog owners to create a similar but less involved effect: when a dog pulled, the collar would get tight and create a choking sensation. This was supposed to get the dog to stop pulling. The martingale as a “training tool” eventually faded in popularity because many dogs respond to a sensation of choking with more pulling! It might surprise you to know that day in, day out, I exclusively use martingales. Metropolis or backcountry, this is my dog walking gear of choice. How I fit a martingale: Instead of fitting the loose collar to the size of the dog’s natural neck measurement, I fit the tightened collar to the size of the dog’s natural neck. That way, the collar tightens to the dog’s natural neck size, no tighter. For puppies and dogs in training, I have a strong safety suggestion regardless of whether you use a martingale OR a regular collar. 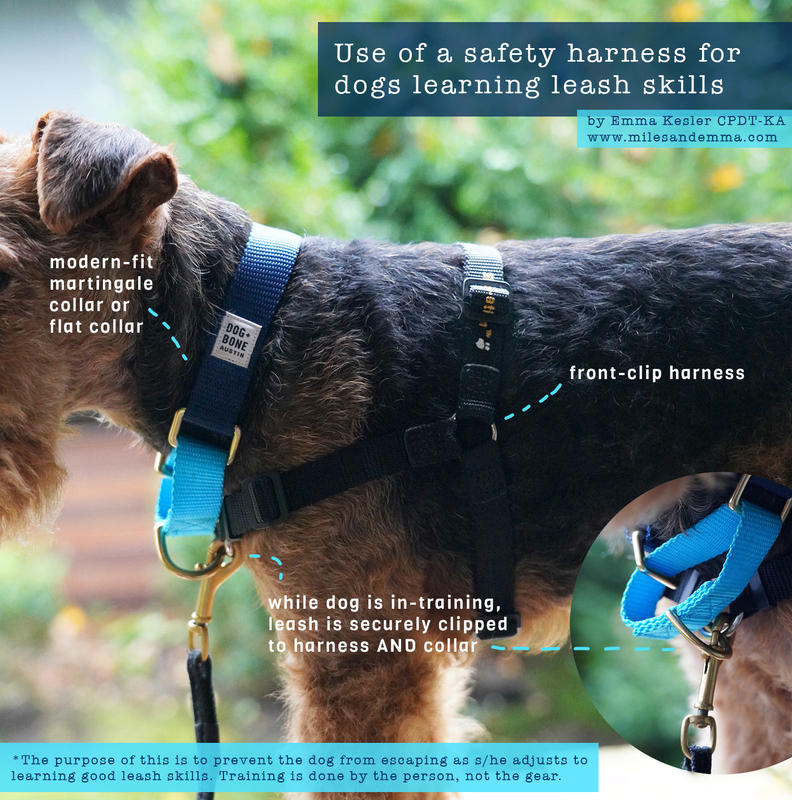 I rarely recommend a harness as a training tool, however, I strongly recommend a front-clip harness for safety as you train leash skills, especially for flight-risk dogs. Click here to see an image of how I recommend using a safety harness for dogs who are new to leash-training. Martingale collars that look modern and suit this new use are actually pretty hard to find! Since they are the only collar I use, I got really excited when I came across Dog + Bone a year ago. They have a simple collar, that features a color block look, durable nylon webbing, and brass accents. Dog + Bone is a small American business. The founders give back to good causes such as dog rescue organizations, which is dear to me, because so many Welsh Terriers end up in rescue and re-homing situations. Miles is trained 100% force-free using my methods and has helped me prevent many, many Welsh Terriers worldwide avoid rescue situations. Because everything is made in-house, I feel a personal connection to every collar and leash that leaves our studio. It’s very humbling to see our products out there and know that they have become a part of daily life for people and their dogs. Change is good. I hope this article has given the martingale a new boost, and if you are going to get a modern one, I highly recommend checking out Dog + Bone (Welsh Terriers fit a size Small). If you have any questions about “modern martingale” collars, including how to find one to fit your dog from any company, please comment below! I am happy to help. Mom will only buy me martingale collars! We both love them! I never really understood what martingales could be used for! I think I am going to get one for my Welsh Terrier Bruno. What is the width like on the Dog + Bone collars in the small? Thanks for this post!! That’s what I use for my 2 boys too! I love these collars because they are safe and convenient, specially at agility trials. My boys are hairless kind, and regular collars rub their skin in their neck, so these nice and loose martingale collars works the best for them. I’ve checked out the link – they have nice selection of colours. Now I know where to get the next one! Thanks for the info! At your recommendation, George wears a Martingale collar exclusively, and we couldn’t be happier! It’s true, he never slips out of it, and it’s oh so comfortable on our jaunts. It’s been especially helpful in leash training. You always have the best advice. No pulling. We looked at Dog+Bone and decided to get George a silver & gold collar that is perfect for the holidays. If we are wearing something glam, he should, too!! Thank you for this great article.